‘Lifted Boxes’ is a design of contemporary office compound by Earthitecture. 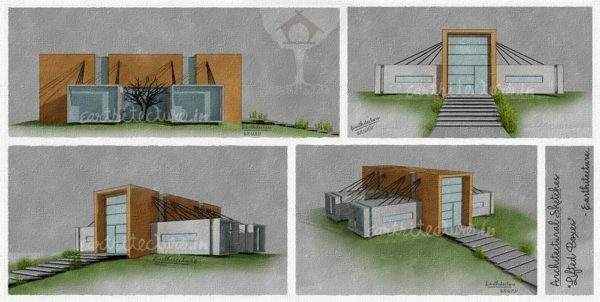 Series of sketches illustrating different views and elevation of ‘Lifted Boxes’. Aesthetically contemporary design with open planing which creates interesting work spaces. The design consist of one cuboid element standing in the centre ,divided into 3 pieces with glass which is a core passage of the building. The whole cuboid is lifting other 4 boxes through tensile manner which is functionally used as a work spaces. To give more ‘Lifted’ look, the outer sides of the four boxes kept floating. Straight Lines and sharp edges enhance the look aesthetically.